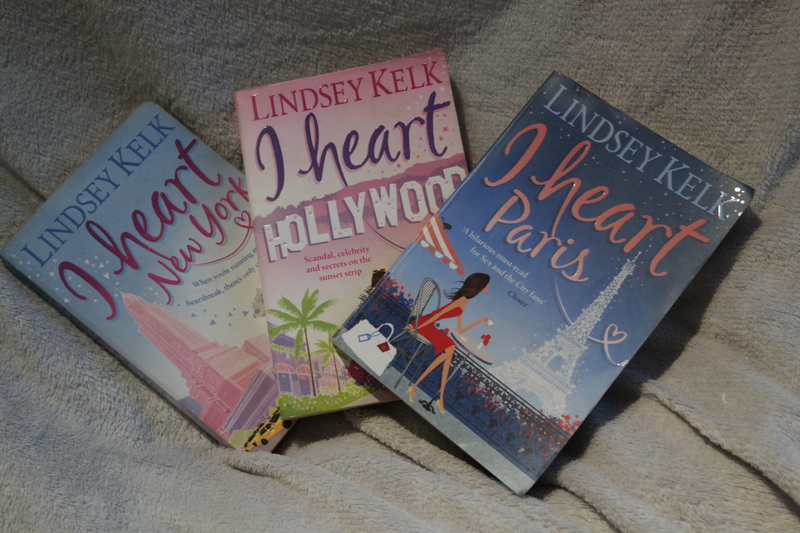 I feel a bit cheeky naming this post a quadrilogy review because I’m yet to read the fourth book, I Heart Vegas* and the fifth book, I Heart London* by Lindsey Kelk I have however read the first three books in this series, I Heart New York*, I Heart Hollywood* and I Heart Paris*. I have to admit they are one of the best series that I have read. I like easy reading. I like books I can relate to. So I tend to stick to young adult books. A friend that I worked with bought this book the year it was released and would read it on her lunch break. When she was finished with it I asked if I could read the back, which may have led to me reading half the book that day. I enjoyed it so much that as soon as I was home I jumped online and ordered myself one! The story begins in London, with twenty-something Angela Clark catching her Fiancé cheating on her in the back of their car whilst they are at her best friends wedding. The worst part being that everyone already knew, except Angela. Angela escapes to New York for what is planned to be a little while. She rents a hotel room for a few days whilst she is there and a lot of unexpected things happen. She befriends one of the hotel clerks, She meets two very different men along the way, both who sweep her off her feet, there is a lot of shopping and she ends up bagging a job doing just what she loves, writing! What we really want to know though is, will she go back to London, as her family and friends are urging her to, or will she stay in New York and fulfil her dreams? I Heart Hollywood is the second of five books in Kelks I Heart… series and having enjoyed the first one so much I couldn’t wait to get my hands on this book as soon as it was released in 2010. In I Heart Hollywood Angela Clark is given a big opportunity to go to Hollywood and interview the gorgeous actor James Jacobs. Problems start to occur between her and her new boyfriend Alex when photographers snapping some photos making it look like her and James are an item. On top of this she is really close to losing her job which also means losing her Visa and having to go back to her old life in England. Angela has to try to prove that there is nothing going on between her and James but this is not going to be easy. No one believes her and she has to admit looking at the pictures it does paint a pretty convincing story. But Angela finds out some information about James which could save her but how will she be able to prove it? The sort of this book defiantly doesn’t match the title though because Angela defiantly didn’t heart Hollywood. I didn’t really enjoy this book as much I did the first one. I didn’t buy this book as quickly as the others because i was a little let down by the second, but oh my goodness did Kelk bring it back to life with this third book! The moment Angela boards the plane trouble starts and the disasters keep coming. When Angela arrives in Paris finds that her luggage has been blown up so she only has the items which she is standing in. If this was not bad enough when she walks into the cafe to meet Alex she sees a blonde bombshell sitting on his lap! Angela finds herself very isolated and a little home sick in this third book when she finds out some truths about Alex’s past, and finds herself at a point where her job, relationship, and friendships are all on the line. What was meant to be a nice romantic break to Paris was actually the break from hell. You find when you are reading this book you keep thinking surely things cannot get any worse for Angela but something else always seems to happen. That being said there is an unexpected twist towards the end! I felt more connected to Angela in this book and I really warmed to her. I enjoyed these books so much I am now going to try to get my hands on the other two books. * I am not in any way sponsored by amazon, I only linked this site as it had some of the best prices.